This design combines 3 tones with natural design that does not create too drastic color change. The color blends very well with eye and create a pleasant tone. 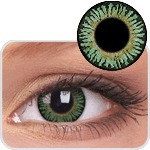 Made from newly developed skin-like material which prevents damage to cornea. ColorVUE contact lenses is remarkably comfort on eye as a result of excellent oxygen permeability. The lenses are manufactured through sandwich method, prevents the colors in contact with eyes, ensures safe wearing without any side effects.